This image was taken on June 07, 2010 and received on Earth June 07, 2010. 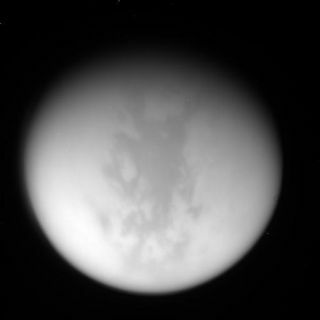 The camera was pointing toward Titan at approximately 1,110,349 kilometers (690,000 miles) away, and the image was taken using the CL1 and CB3 filters. This image has not been validated or calibrated. A validated/calibrated image will be archived with the NASA Planetary Data System in 2011. NASA's Cassini spacecraft snapped new photos of Saturn'sbiggest moon Titan during a recent flyby over the moon's northern pole thattargeted the home of the cloudy moon's largest methane lake. Cassini made its closest approach to Titanon June 5 UTC (Friday afternoon, June 4 Pacific time), when it zoomed withinapproximately 1,300 miles (2,000 km) of the giant moon's surface. Missionscientists at NASA's Jet Propulsion Laboratory in Pasadena, Calif., hoped toget another good look at Kraken Mare, the biggestlake on Titan, which spans an area greater than the Caspian Sea on Earth. The hydrocarbon lake, which covers about 150,000 squaremiles (nearly 400,000 square km) is filled with liquid methane and ethane ?molecules of carbon and hydrogen atoms. Titan's lakes are of particular interest to scientistsbecause of the potential for these chemicals to create an environment thatcould support life. Still, no firm proof of life has been found on Titan. Cassinitook infrared scans of the Titan's north polar region, which was cloaked indarkness for the first several years of the spacecraft's tour around the Saturnsystem. As northern spring has started to dawn over the area, the lighting hasimproved, allowing Cassini to get a better look at the hazy moon. During the flyby, the visual and infrared spectrometer were theinstruments of choice during the closest approach, but Cassini's imagingscience subsystem cameras also snapped pictures. Although this most recent flyby is dubbed "T69,"planning changes early in Cassini's orbital tour actually made it the 70thtargeted flyby of Titan. Last month, Cassini got close-up glimpses of Titan andEnceladus, another of the ringed planet's moons, in a doubleflyby. Cassini performed radio science experiments as it passed by Titan andcollected data about the moon's internal structure. NASA launched Cassini in 1997 and the spacecraft arrived atSaturn in 2004. It dropped a European-built lander called Huygens on Titan aspart of its joint mission between NASA and European and Italian space agencies.Cassini's mission has been extended through 2017.